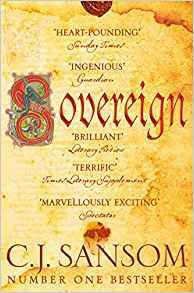 Sovereign by CJ Sansom is the next in the Shardlake Series that I read. Here Shardlake follows the king on a progress to the north and once again gets embroiled in lots of conspiracy and mystery. Sansom shows us his meticulous research and gives a fascinating insight into the 'behind the scenes' or the Tudor court. New characters introduced sees a love interest for his side kick plus the king being a nasty to our now endeared Shardlake. Already in the city are lawyer Matthew Shardlake and his assistant Jack Barak. As well as assisting with legal work processing petitions to the King, Shardlake has reluctantly undertaken a special mission for the Archbishop Cranmer - to ensure the welfare of an important but dangerous conspirator being returned to London for interrogation. But the murder of a local glazier involves Shardlake in deeper mysteries, connected not only to the prisoner in York Castle but to the royal family itself. And when Shardlake and Barak stumble upon a cache of secret papers which could threaten the Tudor throne, a chain of events unfolds that will lead to Shardlake facing the most terrifying fate of the age . . .